Edit: to "smart" people thinking this is an April's fool - republished it, it's after midning here, no - it's a serious article. Happy? one of the iconic vehicles of the Third Reich and the testament to Dr. Porsche's ingenuity is the Maus, mostly because it is (and probably always will be) the heaviest tank ever built. Most people know the vehicle itself, but there are other (less known) vehicles (in two cases derivates, in one case a different vehicle) bearing the name Maus. Let's have a look at them. Maus II - as the name suggests - was the followup on the Panzerkampfwagen VIII "Maus". Basically what happened: the history of Maus development itself is quite complicated and covered sufficiently in other sources. The development took place mainly in 1943, with 1944 being the trial year for the two manufactured Maus prototypes. In March 1944, as Ferdinand Porsche was trying to get the Maus production on track (it didn't have to high a priority and there were numerous delays, a lot of them being at Krupp facilities), Krupp designed an improved turret to the original Maus hull, designated "Maus II Turm" (Maus II turret). It was to be armed with the 128mm KwK (presumably KwK 44 L/55) and the 75mm L/24 gun above (!) the main gun, with a breech redesigned by Krupp (the 75mm served for close support). This turret required a larger turret ring, which was discussed between Krupp and WaPrüf 6 in April 1944. Other changes included an improved ventilation system, cartridge fume extractor and a different (slightly narrower) rangefinder. Krupp also proposed the frontal turret armor to be sloped instead of rounded. World of Tank wise, Maus II would provide a historical tier 10 alternative to the regular Maus. Balance-wise, those are quite similiar vehicles, but the Maus II turret is better armored. Why the hell did Wargaming go for the completely fake Failowe (AKA 72 ton project which itself is extremely dubious "stretched" to double its weight), I have absolutely no idea. SturmGeschütz Maus was the alternative program to the SturmGeschütz E-100 (often - incorrectly - referred to as Jagdpanzer E-100). Amongst the modellers, this vehicle is known (also incorrectly) as "JagdMaus". Both project originate at the same point in time. On 9th May 1944, a meeting was held between Porsche and Krupp, where Ing. 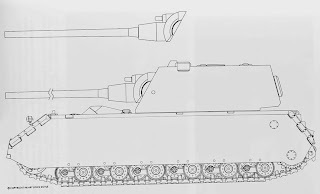 Schmidt from Porsche presented sketches of the 150mm L/63 and 170mm L/53 Sturmpanzers based on Maus chassis, developed by Krupp in cooperation with Porsche, that were to compete for the superheavy Sturmpanzer contract with the Adlerwerke and their E-100 - based Sturmpanzer. In May, the discussions continued with the 150mm variant being favoured over the 170mm. Porsche tried to "smuggle" a Flakaufbau (anti-aircraft miniturret), but that was denied, as it was planned for the superheavy vehicles to be escorted by AA tanks (Flakpanzers). The plans never reached any serious stage however. In May 1944, there were only rough sketches and conceptual ideas (none of which unfortunately survived, the picture of the model above is only a modeller's impression, how it could have looked). One of the issues of the design was the height - the tall Maus chassis and the superstructure simply made a very tall vehicle, despite the fact Krupp mounted the observation equipment into the superstructure. The ammo capacity of 85 rounds was planned. By the end of the May it was decided the E-100 chassis would fit the project better (we can speculate it was the height issue). A mockup was ordered, but it never really happened. On 10th of July, Adolf Hitler personally stopped the development of all superheavy vehicles via Albert Speer (the Maus project itself was worked on until August) and that was the end of both superheavy Sturmpanzers. In March 1942, Germans are no longer meeting a disorganized and devastated Soviet tank troops of 1941. Some seriously tough tanks are encountered, namely the T-34, KV and the KV-2 heavy vehicles, which - although relative rare, horribly unreliable generally a (in the words of S.Zaloga)tactical failure, cause a scare. By that time, Hitler (and the industrialists) start to actively play a role in Panzer development - him specifically by ordering (influenced by his personal friend, Dr. Ferdinand Porsche) all sorts of retarded ideas, mostly in the "we need it bigger" direction. On 5th March 1942, Krupp recieves a directive that it is to inflate the earlier concieved 70 ton Panzer projects (the Löwe series) to 100 tons, so the new supertank is ready at the latest in Spring 1943. Later in March, Porsche recieves the same order and that's how the Maus development actually started. The "Löwe" line is developed in parallel to a certain extent (the last known heavy Löwe variant - with turret set in the middle - is from May 1942), but in September 1942, the Löwe development is cancelled and onwards goes the Maus. I'll get a bit offtopic here: this is where the "Failowe" comes from in Yuri Pasholok's mind. Basically, there historically there were three "branches" of the German superheavy Panzer development: the Maus branch, starting with a VK100.01 project by Porsche, moving on to the Maus and ending with Maus II with the new Krupp turret. Second branch is the E-100 branch by Krupp (later Adlerwerke), being a direct competitor to the Porsche Maus project. This branch started with the Krupp E-100 proposal, the Tiger-Maus and ends with the Adler E-100. Third - blind - branch is the Löwe branch. This branch is older than the Maus or E-100 branches (the earliest Krupp VK7001 - Lowe predecessor - proposal is dated at 27.2.1942) and never exceeds 90 tons (which is the last Lowe project from May 1942, armed with a 150mm L/40). This branch gets completely cancelled (the last remnant of it - the turret - gets, as mentioned, cancelled in September 1942) and from that point onwards, there is only one superheavy tank program, for which two companies (Krupp/Adler and Porsche) compete with their projects. Yuri Pasholok believes that by disinterpreting one line in Panzer Tracts 6-3E (1st page), he "proved" the existence of a 120 ton unspecified Löwe offshoot, that actually "survived" the Löwe cancellation and later "competed" for the Maus/E-100 contract (the model itself is an early Lowe mutant with turret in the back). It's a complete crap and for historical materials, I will link you to Zarax's article on the matter. Back to the Tiger-Maus. The whole Krupp Tiger-Maus 150ton tank concept came to be in September 1942, shortly before the Lowe turret development cancellation. Krupp was basically "taunted" into making a competing concept to Porsche's Maus - a 150ton tank powered by a proposed HL230 1000hp upgrade. The design was made very quickly and in November 1942, it was discussed within the Panzerkomission (a civillian committee of industrialists and tank designers). It was to use the Tiger(H) components, hence the name - including the engine and drivetrain, but there were worries about the insufficient horsepower to weight ratio. The Tiger-Maus was to reach only 20km/h top speed too and its terrain passability (specifically climbing ability) was questioned too. Additionally, there had to be a new final drive and steering unit designed, as the old Tiger one limited the speed further to 13 km/h. Possible engine upgrades, discussed in November 1943, included the Daimler Benz MB501 and MB503 1200hp gasoline engines and the MB507 1000hp one. In the end, the Krupp hull weighted 122 tons and was to be powered by a 1200hp MB507 engine. The armament was the 150mm L/37 gun and a 75mm L/24 secondary cannon in a 47,5ton turret, making the vehicle nearly 170 ton heavy. On 1st December 1942, the project was named "Tiger-Maus". During the further development, significant changes were made. 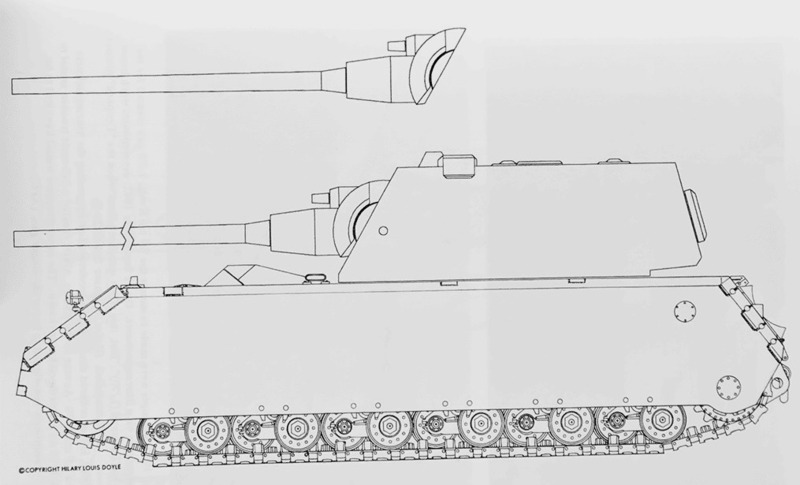 By shortening the chassis (and widening it for better ground pressure), the proposed weight dropped to 130 tons and the drivetrain components were taken from Tiger II. The engine used in the end was the Maybach HL230 with 700hp. The armament remained the same, the vehicle had a proposed crew of six. The vehicle had the advantage that it used many existing components and could be quickly produced - the 130t design was ready on 8th December 1942. It was recieved very favourably at first - but then, arguably F.Porsche's friendship with Hitler played a role and the decision to develop this vehicle further was overturned. On 15th December 1942, Krupp recieved an order to stop the Tiger Maus development, allegedly because the German military wanted to avoid the dual development fiasco of the Tiger and Porsche's Maus was scheduled for development instead of the Tiger-Maus. Krupp representatives even met with Hitler personally, but without success - on 31st December 1942, the Tiger-Maus development was stopped. The Tiger-Maus later turned into the E-100 project by Adler, but that is a story for another time. There are no original Tiger-Maus drawings unfortunately, so we can only guess how it could have looked. it probably resembled the later Adler E-100 project, there are some rumors however that the design might have had the turret set more to the back, even to the point of resembling the Porsche Maus. Personally, I doubt that. This is a model of a "Flak Maus", armed with twin 88mm guns. While it looks cool, it wasn't made by the Germans, it was made by some modeller, it's a complete fake, there were no plans for such a vehicle. 'The Mouse That Roared' Nice reference in the title, gotta love Peter Sellers. Oh, and great article, I remember Overlord's 'joke' German Tech tree with the 'Maus 2', interesting to see there was some mild historical basis for it. Yep, it's a classic. Maus II is actually historical indeed, although not very different from Maus I - as I mentioned, it would be an ideal candidate for the "tier 10 reward tank" for Germans. I have to say, it's not really surprising that the Germans are now only getting post-war tanks, seeing as they must have designed about a hundred super-heavy tanks each day of the week during wartime. And that's just the stuff that's survived today. Goodness knows how many more drawings must have been destroyed in the closing days of the war. can you imagine the rage amongst the players if they would "reward" them with yet another german super heavy tank? Like, you know... the Leopard 1? You know, one with some armor too? you know the e 50 line? The second vehicle described in this article. Oh sorry I did not see name Sturmgeschütz when reading first time. My bad. Why does the artillery should get a 188+ ton platform? With such a high profil? Sturmgeschütz is not really just an artillery vehicle, it's also a heavily armored direct fire platform. Well, not as a rule... 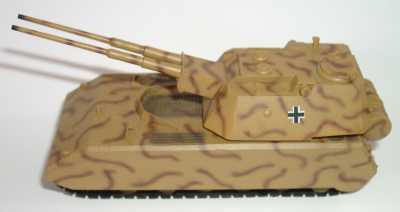 I mean, for example, the Panzerjäger Tiger (P) (Elefant) was used by both unit types. By the StuG guys with success, by the Jagdpanzer guys - not so much. Elefant and Ferdinand are both the same vehicle if you mean that, one basically had a machinegun added - minimal differences. By the StuG guys with success, by the Jagdpanzer guys - not so much. I think it was the other way around. The Jagdpanzer guys were experienced in engaging tanks and could use ferdis potencial, while the Stug guys felt somehow unvulnerable which led to some over the top actions. Well, Silentstalker, I mean I found the Ferdinat /Elefant, both, (yea I know it's just a modification) Listed as "Sturmgeschütz" and as "Jagdpanzer". Anon: No, it was like I say it is, Doyle personally explained that in the Operation Think Tank: StuG guys knew how to lie in ambush, they waited for their prey and caused devastation, while Jagdpanzer guys started feeling invulnerable and drove around until they got wrecked and lost their vehicles. Assault guns in general were hotly contested between the two army branches. Anyways, all kinds of assault guns fared well in ambush or infantry support, the surviving german AAR are in stark contrast depending on who wrote about them. Infantry loved the armored support, while tank commanders found them unflexible tactically and preferred turreted designs. Short Conclusion: It's a total mess. "Other changes included an improved ventilation system, cartridge fume extractor and a different (slightly narrower) rangefinder. " Did the first Maus turrets have a rangefinder? I thought they had none! Also, was the fune extractor supposed to be mounted on the barrel? I have never heard of anything called a cartridge fume extractor, so I don't really know what it differs from just an ordinary fume extractor. As for the fume extractor, it's the same thing apparently - described as "fume extractor for the 128mm bin"
I thought fume extractors wasn't invented until the late 40's because I have never seen nor heard of a WWII tank that had or was plannef to have such. May not have been the kind of bore evacuator the 'Muricans came up with and which has been more or less standard in tank guns since then; probably something at the breech end instead - that's what the Yanks initially tried on the T34 too, apparently. Maus II turret looks like E-100 turret in game. So, I take it we'll be seeing the similar article about E-100, in the future? You wrote: "The Tiger-Maus later turned into the E-100 project by Adler, but that is a story for another time." And I was just wondering, but nevermind. Yes well, technically you are right. Doyle states that the first Flakaufbau was cancelled, the 30mm Flakturm was investigated, but nothing is said of its fate. Considering the fact the vehicle was too high like that already, I doubt it led anywhere. Plus, I didn't want to get into too much detail, after all, those who are interested can get the Panzer Tracts. It's April 1st 6:33pm in Alaska. As long as one way or another I'll get my Maus II with KwK 44/2 128mm L/61. Just wonder why they never even considered the Adler E100 with the actual Adler turret? The tank was built and sceteched by adler iirc, so the logical course of action is that it would have recieved the adler turret. It would give the E100 so much more style at least, that turret would make this thing a beauty. I am not sure, would have to look. My guess: a) Adler didn't have capacity (unlike Krupp) to actually produce it b) Krupp influence on the Panzerkomission. US Post War Intell. Assessment on Maus syas it was planned to have the 15cm main gun which would likely be the Maus II. It's unlikely they just pulled that figure out of their arse so it would have been based on contemporary records. How come no 15cm main gun for Mauds or Maus mentioned? 15cm gun on Maus turret was an early Krupp plan. It got dropped in favor of the 128mm as it allowed for higher ROF and it used an easier to produce cannon. Remember Maus was a very taxing tank to produce and used up Krupp facilities that usually produced heavy field guns. So why does the in-game Maus not have the better turret? Well, it has a historical turret. Yes, it could have the Maus II Turm as an upgrade. Hi SS, On the forums and around the net there is talk of fitting the E-100 with a Tiger 2 like turret. Variously called the henschel turm or the adler turm. Does this have any basis in reality or is it another post war modeler's dream? I think that's where the modellers got confused by the name Tiger-Maus and started thinking that it might actually be a Tiger II turret (as mentioned, the Krupp Tiger-Maus was to use some of the Tiger II drivetrain components). It's a fabrication. The Tiger Maus is described above and by the time the Adler E-100 makes appearance, it is already considered with the Maus-II-like Krupp turret. Interesting article. Do you know where wg got the design for JPE-100 from? Yes. They made it up the way they thought it looked. No historical conceptual drawings survived the war (however, it is clear that the JPE-100 still had a casemate construction, so at least we know the Krokodil is still a fake, as confirmed by G.Doyle). There was proposal in wot forum to downgrade by tier whole porshe line and put maus 2 as t10, maus t9, vk45b as t8 but no one at wg cares so its left forgoten. Maus as tier 9 is retarded fanboy moment. I will cover both Maus and E-100 in some "Buff my tank!" articles. It would have made an excellent defensive focused line and allowed the VK4502P to be set to closer to history stats. E-100 could be buffed with a planned 1500HP engine and germans would be competitive again. Sounds like the line SHOULD look like. Unfortunately, noone at wg cares what others think - expert or not. How would it disbalance the E-75? IS-8 and M103 have guns with 268 and 269 penetratrion, respectively. IS-8 has no no armor however and M103 is quite fragile. Very interesting read Frank, you say that the Maus II would be heavier armoured then Maus I. Are you only talking about the turret or did they change the armouring of the hull aswell? As far as I know, the hull was unchanged. But - as a curiosity - there was a plan (unrelated to Maus II) to actually fit the hull with twin heavy flamethrowers (the same type used on Flammpanzer III). About uber-tanks: can you tell me why nobody ever says a word about Karl-Gerat? It was more real than many tanks already in WoT. I agree it would be like tier15 arty in tier10 game in terms of firepower but still - it WAS real. Maybe you could make an article and start a discussion? Its the sadly very slow reload time. 10-15 mins. so JG-E100 is ture ? ,The war loser are all fake. anyway, make this game more balance. I shouldnt be surprised by now how batshit insane the germans were with WWII tank design. Yet everytime I see a new design with 120mm+ gun, I just cant help wondering WTF the germans were thinking? The Panther/Tiger were wrecking allied tanks with their respective 75mm/88mm guns and bouncing shells all over, but no, the fuhrer must have a tank with a gun that fires freight train sized shells and 5 miles worth of frontal armour. "there were no plans for such a vehicle." Well, we know what WG does for that. Sends SerB off with his crayons. I would love to see a Jadgmaus, looks much more like a "maus".